Conduction disturbances can occur at the level of the sinoatrial (SA) node, the atrioventricular (AV) node and the bundle branch system. In atrioventricular block the conduction between atria and ventricles is disturbed, leading to an increased PQ interval or to P waves that are not followed by QRS complexes: atrial activity that is not followed by ventricular activity. Three degrees of block can be distinguished. The PR duration depends on the conduction velocity in the atria, AV node, His bundle, bundle branches and Purkinje fibers. In first degree AV block there is a prolongation of PQ duration (PQ time > 0.20 sec). Still every P wave is being followed by a QRS complex. First degree AV block is present in 16% of >90-year olds  and is mostly caused by a degeneration of the conduction system. First degree AV block is relatively harmless. The PQ interval that follows upon a dropped beat is the shortest. The RR interval shortens (!) every consecutive beat. The conduction disturbance in a type I block originates in the AV node. Isolated second degree AV block type I is relatively benign and not a pacemaker indication. In second degree AV block type II, beats are dropped irregularly without PQ interval prolongation. 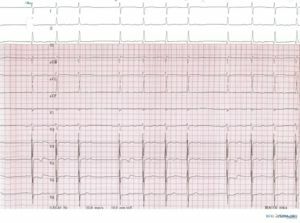 As the drop out of beats is irregular, no clustering of QRS complexes can be seen as in second degree block type I. Second degree AV block type II marks the starting of trouble and is a class I pacemaker indication. The cause of second degree AV block type II can be found distally from the AV node: in the HIS bundle or in the bundle branches or Purkinje fibers. An important differential diagnosis of second degree AV block type II is an premature atrial complex with compensatory pause. This diagnosis is much more common and harmless. High grade AV block is defined as two or more p-waves not followed by QRS complexes. 3rd degree AV block. AV dissociation is present: there is no relation between p-waves and the (nodal) QRS complexes. Third degree AV block is synonymous to total block: absence of atrioventricular conduction. 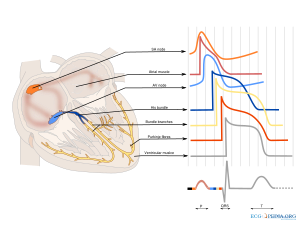 The P-waves and QRS complexes have no temporal relationship, which is called to AV dissociation. The ventricular rhythm can be nodal, idioventricular or absent. Absent ventricular rhythm results in asystole and death. During third degree AV block the blood supply to the brain can insufficient, leading to loss of consciousness. Adams Stokes (or Stokes-Adams) attacks (often misspelled as Adam Stokes) attacks are attacks of syncope or pre-syncope in the setting of third degree AV block. This page was last edited on 24 July 2011, at 18:48.